That was the commonly accepted belief and unwritten rule of career advancement in the company where Holly Meidl worked early in her career. A rising star in the insurance industry, she was told, ‘‘You’ll never be able to return to working in a role that’s significant or make a major impact,’” recalls Meidl. When it comes to conventional career and business wisdom, some rules were meant to be broken. Meidl left that company to become primary caregiver to her young family. It was during this time, while being active in her children’s schools and local community, that she learned a lot about people, “grassroots” leadership, and collaborative influence. When it came time to re-enter the workforce, those lessons helped Meidl to leapfrog beyond her prior roles to land a national leadership role. “When I returned, I was thrown into a different industry and division,” she recounts.” Yet, with all that I’ve learned and the experiences that I’ve gathered, I was able to parlay that skill set into this new role.” Now, she serves as the Senior Vice President of the Healthcare Division at Allied World Assurance Company in Hamilton, Bermuda, proving that not all rules are set in stone, and fortune can smile on rule-breakers. What are the unwritten, unspoken rules of your workplace? Do any of these scenarios sound familiar? • You must be a senior engineer for two years before becoming a principal engineer. • Only the Vice President can negotiate with customers. • Presentations to C-suite execs must be three minutes or less. • Only external candidates will be considered for Director-level roles. • You need to meet 100% of the job requirements before applying. 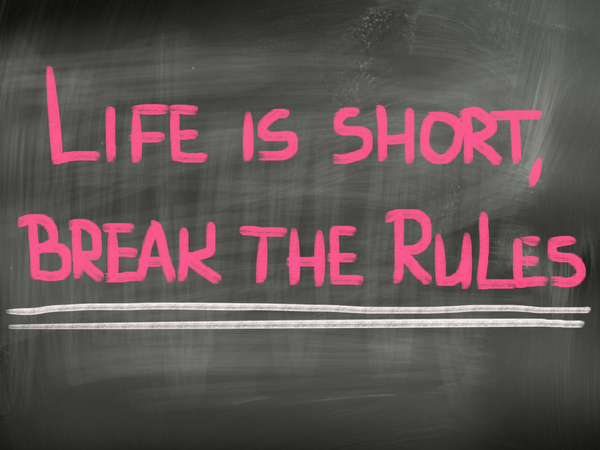 So what does it take to be a successful rule breaker? I wanted to learn how leaders exercise good judgment and make great decisions when taking risks and breaking rules. I invited Meidl to participate as a panelist in a webinar titled “Breaking the Rules.” I wanted to understand how she assesses opportunities and risks before making a bold career move or business decision. I wondered: How does she know when to conform to the unwritten rules, and when to be creatively disruptive? “I have three simple rules that I learned while in school that have continued to guide me,” shares Meidl, who credits a college professor, Dr. E.J. Leverett, with teaching the risk management principles that have become guideposts for her life. 3. Consider the odds or the potential consequences. “I allow these principles to guide me at times when I am thinking about breaking a rule,” says Meidl. “Professor Leverett passed away in the 90s, but he would be thrilled to know his rules live on and have impacted so many lives. • What rules are you considering breaking, in business or in your career? • How can you apply the three rules or risk-management to make a gutsy, but sound decision? Whether you’re asking for a promotion outside of the review cycle, re-engineering a business process that’s always been done a certain way, or sitting at a blackjack table in a Vegas casino, these are three great rules to live by.